Solar power as alternative source of energy can greatly reduce the electricity bills and provide great savings over times. But in course of times the dirt and residue accumulates over the solar cells and thus the cells don’t work as efficiently as they used to. Thus for optimal performance these dirt and grime should be removed periodically and the panel should be properly cleaned. So, every household having a solar system in place must know the appropriate methods to clean his power panels. 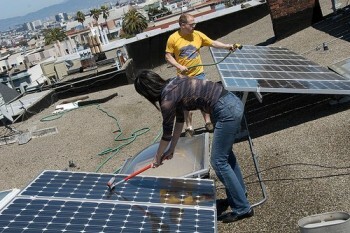 The solar cells are quite delicate so the panels need to be cleaned with care. The cells transform solar energy to electricity when they are clear; so cleaning them increases the efficiency but if any scratch occurs in the process, it not only wastes the time involved in cleaning process but also proves costly to replace the damaged cells. Anybody interested in reducing the maintenance cost by cleaning the solar panel himself, he should follow the proper procedure for the do-it-yourself (DIY) to avoid any unpleasant situation where any such cleaning not only get wasted but also proves a burden on the wallet in replacing damaged solar cells. The first step of do-it-yourself to clean your solar panel begins with regular inspection of the solar cells. By regularly inspecting them, you will able to find out when they get dirty enough and the accumulated dirt starts affecting the efficiency of the cells. In some areas like desert, where lots of dusty storms took place, more regular inspection and cleaning are required. While inspecting solar panels you should ensure that solar cells do not have any cracks and all the connections are tight and there is no sparking in any connections. Cleaning the solar cells is just like cleaning the window as the cells are protected by outer glass layers. You simply need warm water, mild detergent, soft sponge and soft drying cloth. Ready-made cleaning liquids can also be used which are readily available at the stores. The simply best and cost effective method to clean solar panels are spraying warm mild detergent water on the surface and carefully sponge off the dirt and grime. And then again spray simply warm water and clean with soft drying cloth. Once all the grime has been removed one should ensure that there is no soap left on the glass surface as any soap leftovers might result in forming of streaks affecting the performance of solar cells. In using ready-made solar panel cleaners, you should be careful in reading the instructions before cleaning with them. However, if you feel uncomfortable in doing yourself you can always hire a professional to do the job for you in a bit more professional way without any worry of applying wrong product on your solar panels. There are a lot of professional companies that specialize in cleaning household products. And finally whether you hire any professional or do it yourself, you should spare some time to make sure that the solar panels are thoroughly cleaned and there is nothing hampering the solar cells from converting solar energy to electricity for you.